Apollo 11 astronaut Buzz Aldrin poses for a snapshot while inside the Lunar Module in this July 1969 NASA image. Aldrin and astronaut Neil Armstrong were the first humans to land and walk on the moon on July 20, 1969. A viral story that's making the rounds online claims Buzz Aldrin, the famous astronaut who traveled with Neil Armstrong to the moon aboard Apollo 11, somehow proved via a lie-detector test to have seen a UFO in outer space. Let's be very clear here: This is flat-out wrong. 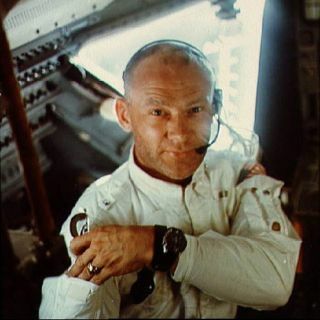 First, the news reports misrepresent what Aldrin actually said. In a Reddit comment three years ago, Aldrin said that, while he did see something shiny out the window in space, he believes it was the sun reflecting off one of four discarded panels from his own spacecraft. The "study" in this case refers to some ill-defined lie-detector test designed to prove that these men had seen UFOs and were "completely convinced" that signs of alien life were genuine, undertaken under "laboratory conditions." This is nonsense for several reasons, but the most salient of them, as The Independent pointed out, is that both Mitchell and Cooper are dead. Cooper has been dead for nearly 14 years. They absolutely did not "take part" in any recent study. "Aldrin believes what he is saying emotionally but has doubts intellectually. His ego, on a highly spiritual level, is solidly involved. He has a firm belief in what he saw but logical awareness that he cannot explain what he saw; therefore he thinks he should be doubted. His gut level emotions and system of integrity is well grounded with the exception that he has some issues around people asking too much of him and expecting him to take care of things for them. For the benefit of the people, he wants his statements about his seeing a UFO to be believed." Again, not only does this directly contradict what Aldrin has actually said on the matter, but it doesn't remotely resemble a computer analysis of any kind. And this is where the third problem with the Star's report comes in: It's scientifically indefensible. Even true lie-detector tests simply do not have scientific validity. The National Research Council's sweeping 2003 report on the matter states, "Almost a century of research in scientific psychology and physiology provides little basis for the expectation that a polygraph test could have extremely high accuracy." There's just no reason to believe this company has the ability to discern truth from recordings of people's voices. While bioacoustics is a real area of scientific inquiry, it simply doesn't answer questions like "Is this person lying?" Instead, it answers questions about what sounds animals make, how they make them and when they make them. The Institute of BioAcoustic Biology appears to be a for-profit company selling pseudoscientific cures for various health issues, with testimonials from people claiming physical ailments have been lifted after listening to custom sets of tones. The company has never published in Bioacoustics, the only international and peer-reviewed journal on the subject, and sources none of its scientific claims in actual science publications. "As a bridge between ancient ideas of sound healing and the futuristic, Star Trek, protocols that the institute provides, it is now possible to reverse diseases and traumas previously thought to be incurable, to reveal the secrets of our true nature, to enhance our lives, to predict what may be our fate through the frequencies of our voice." A reasonable person might conclude that the Aldrin claims, seeming to stem from the Daily Star report, are an effort to garner media attention for the company. In fact, Live Science worried that even debunking the company's claims would throw fuel on the pseudoscience fire. But we decided to write this article because there is, in the end, value in clarifying the science, or lack thereof. Aldrin has been very clear about what he believes he saw in outer space, and Live Science sees no reason to doubt him.